Military Police are needed to not just protect the base and surrounding areas where military members live, but also enforce the laws like other law enforcement professionals. There are even Corrections Officers, or Prison Guards, in the military who work at the various military corrections facilities. The MOS 31Es are assigned to duty stations with military prisons, such as Guantanamo Bay, Cuba, Fort Leavenworth, and Camp Humphreys, Korea. The Military Occupation Speciality is called the Internment / Resettlement (I/R) Specialists in the Army and are primarily responsible for day-to-day operations in a military confinement/correctional facility or detention/internment facility. The Military Corrections Officer deal with two types of prisoners: military members who have committed crimes while serving in the military and foreign prisoners who were captured during combat situations or involved in harming Americans through terrorist activities. If you are a 31E MOS in the Army, you will likely be working with both types - either in established military prisons or temporary confinement areas in foreign countries. Provide rehabilitative, health, welfare and security to U.S. military prisoners within a confinement or correctional facility. Conduct inspections, prepare written reports and coordinate activities of prisoners/internees and staff personnel. Assist with supervision and management of military prisoners. Provide external security to confinement/corrections facility. Supervise, counsel and manage military prisoners in confinement facilities. Supervise confinement facility operations, counseling, management, training and employment of military prisoners in confinement/corrections facility. Job training for an internment/resettlement specialist requires 10 weeks of Basic Combat Training and eight weeks of Advanced Individual Training (AIT) with on-the-job instruction. 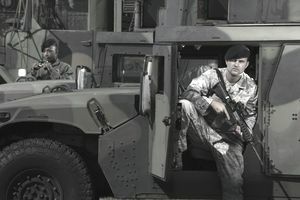 This One Station Unit Training (OSUT) takes place at Fort Leonard Wood, Missouri. All military police get their MOS training at Fort Leonard Wood. Part of this time is spent in the classroom and in the field. Specific formal training opportunities for this MOS, including advanced training courses available at specific points of the soldier's career, can be found from the Army Training Requirements and Resources System (ATRRS). No record of any disciplinary action under UCMJ which indicates behavior inconsistent with the high standards of corrections specialist. No record of more than 15 days lost (AWOL) under section 972-10- USC. No record of civilian convictions other than minor traffic offenses. No record of psychological or pathological personality disorders. Must possess a valid state motor vehicle operator license. Minimum age of 18 at time of entrance on active duty. No medically diagnosed history of alcoholism, psychotic disorders, antisocial behavior, objection to bearing and use of arms when necessary. No behavioral characteristic which may be considered prejudicial to the reliable performance of corrections specialist duties. No record of possession or use of any narcotic or nonnarcotic drug. There is no shortage of work for correctional officers in the law enforcement world after serving in the military. After serving in the Army as an internment/resettlement specialist, you may be eligible for civilian employment by enrolling in the Army PaYS program. The Partnership for Youth Success (PaYS) program is a recruitment option that guarantees a job interview with military friendly employers that are looking for experience and trained Veterans to join their organization.